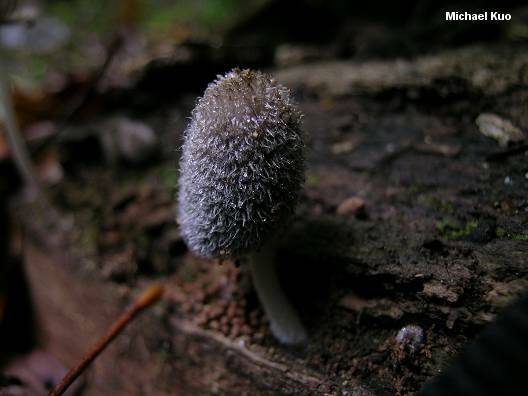 This fuzzy little coprinoid mushroom decomposes woody debris in forests across the globe, and is also occasionally found in urban settings on wood chips, yard litter, and so on. Sometimes it appears to be terrestrial, but close inspection usually reveals that the soil is "lignin rich" and contains lots of woody materials. 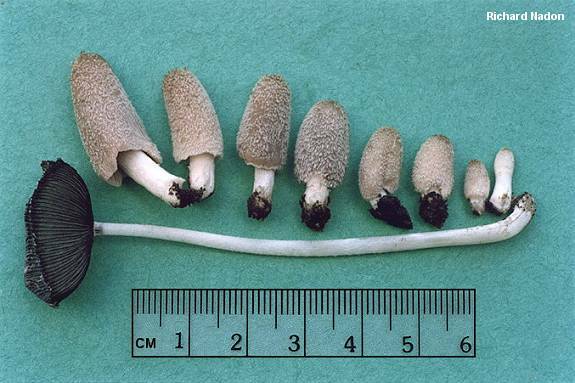 The cap of Coprinopsis lagopus is densely hairy when the mushroom is young and fresh, but can be nearly smooth by maturity (which is often just a few hours later). 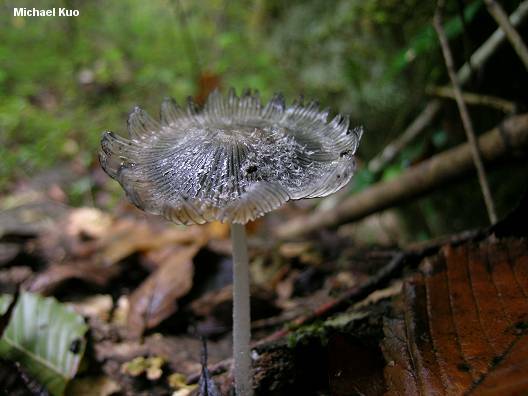 Like most other "inky caps," its gills liquefy and produce a black "ink" as the spores mature and the cap peels upwards. There are many similar tiny inky caps. Some of these look-alikes can be separated by their ecological roles, since they are decomposers of other substrates (dung, grassy debris, straw, sand, and so on). A handful of species, however, can only be reliably separated with microscopic examination. 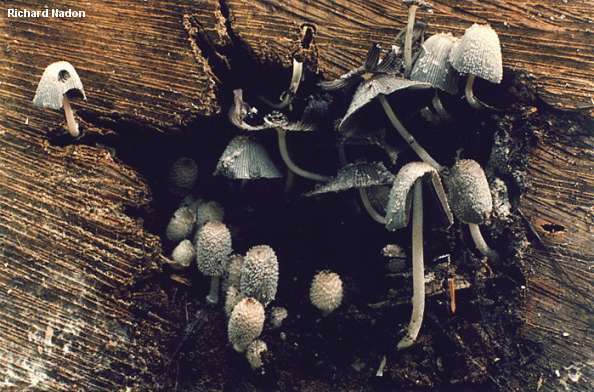 Among them, the widespread and common Coprinopsis lagopides differs in its smaller, less elliptical spores. Ecology: Saprobic, growing alone or gregariously (sometimes densely so) on decaying wood or on woody debris (sometimes appearing terrestrial) in forests or, rarely, urban settings; spring, summer, and fall (or in winter in California); widely distributed and common in North America. 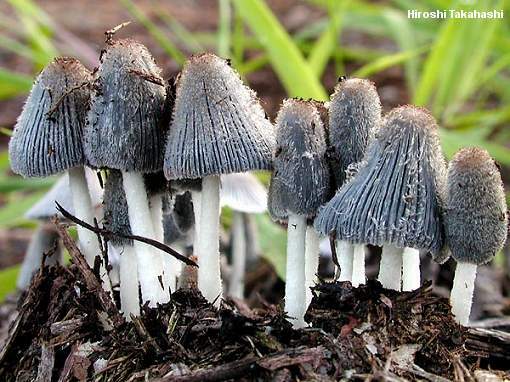 Cap: Up to 4 cm across when mature and expanded; oval and tiny when young, expanding to broadly convex or bell-shaped and eventually more or less flat; gray to black; at first covered with a dense coating of silvery hairs (a universal veil) which break up into patches as the mushroom grows and may eventually disappear; the finely lined margin splitting as the gills dissolve. Gills: Attached to the stem; crowded; pale at first, but soon gray, then blackish; deliquescing (turning to black "ink") or merely deteriorating and collapsing in dry weather. Stem: Up to 2 cm long and .5 cm thick; equal; hollow; fragile; white; densely hairy at first (especially near the base), but sometimes nearly smooth by maturity. Microscopic Features: Spores 10-14 x 6-8.5 µ; elliptical; smooth; dark-dextrinoid; with a wide (1.5-2 µ) central pore. Basidia 4-spored; surrounded by brachybasidia. Pleurocystidia enormous; variously shaped; 70-150 x 20-60 µ; cheilocystidia similar. Pileipellis a cutis with elements 4-35 µ wide. Veil composed of elongated, often semi-inflated (up to 40 µ wide), sausage-shaped elements. REFERENCES: (Fries, 1821) Redhead, Vilgalys & Moncalvo, 2001. (Saccardo, 1887; Smith, Smith & Weber, 1979; Arora, 1986; Lincoff, 1992; Horn, Kay & Abel, 1993; Breitenbach & Kranzlin, 1995; Barron, 1999; Uljé, 2003; Keirle et al., 2004; McNeil, 2006; Miller & Miller, 2006.) Herb. Kuo 10010412.